Best Seller Book Writing System to Plan, Prepare, Produce & Package your book. Checklists, cheat sheets and tips to teach you the ‘how’ throughout our 8 weeks together. 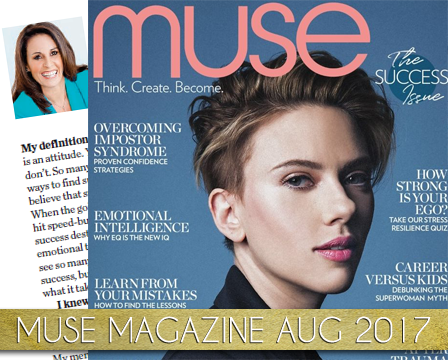 Pam’s Best Seller Influence program was the fastest and most successful way I could have published my book. 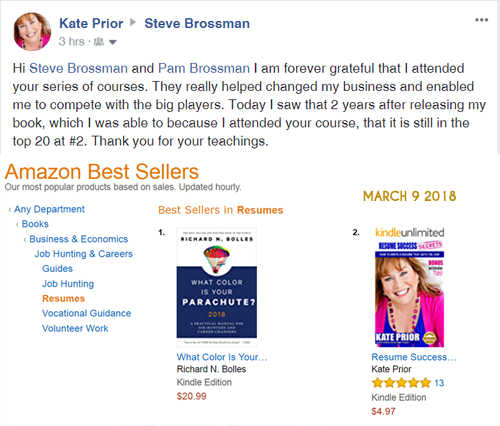 In less than 8 weeks Pam’s course taught me to plan, write and sell my book which happened to get to #1 in its category in Australia and #3 in the USA. From this I got three International speaking proposals in the first week of sales. I love how Pam kept me accountable and set weekly milestones that I had to reach. Every question I thought of and lots more were available to go back to in video format plus there were 2 Q&A sessions per week. It was incredible to get a book finished in such a short time. I am really proud of the result and thrilled at the exposure it has given me. Thank you Pam Brossman. The last thing I expected after suddenly losing my husband in June was to feel empowered along the journey. GRIEF – like every transition – is a very (!) personal story, yet I am sharing mine – vulnerable, raw & with a lot of #love, as I believe it will help a lot of people gain a new perspective! Thanks to the amazingly gifted Pam Brossman for guiding me through the process of writing – your gift is invaluable to me!! Package: choose your Kindle formatting of choice ready to launch your book when it returns from the editor….how exciting! YAY I DID IT!!! #1 BEST SELLER ACROSS THREE CATEGORIES!! This step is so important that I have two complete modules to ensure that you get it right. Get these two wrong, and you can kiss your Best Seller goodbye! I’ve got you covered! I have 100% success rate with all my finished authors in getting an Amazon Best Seller. If you want assistance you can purchase one on one strategy calls with Pam at an extra fee. 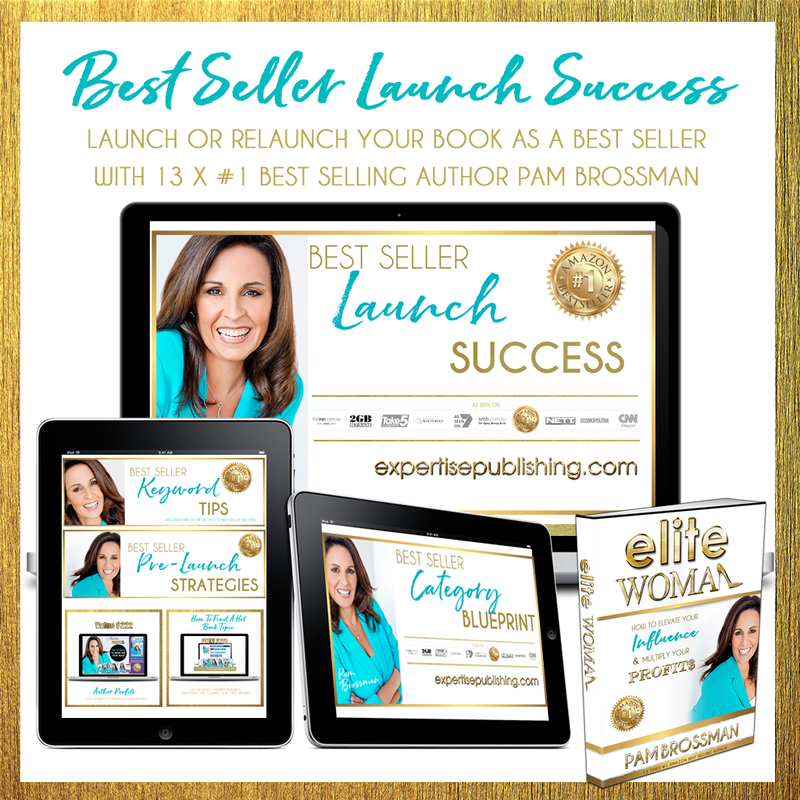 Access to Pam’s Best Seller Rolodex of Resources including editors, format and book covers. I ummmed and ahhhed right up until the last minute before hitting the button and signing up for Pam’s Best Seller Influence Program. It was a huge financial commitment for me, which if it paid off, wouldn’t be a problem. BUT, I have invested in so many things that I haven’t gotten what I thought I would out of and I was desperately hoping this was not going to be the same. Now I pat myself on the back every single day that I took the leap, because I have definitely gotten everything I wanted out of the program and more! Pam teaches things I never would have even thought of or would have known to look for if I had been trying to do this myself. 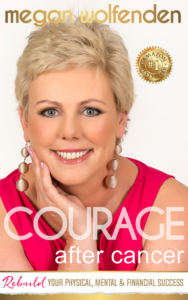 It has taken me 3 years to write my book due to being fearful of a lot of things. Although I pretty much had it written when we started Pam’s course, I know if I had been doing the rest of the process on my own, it would take me at least another 3 years and I probably wouldn’t have a chance of getting a best seller. I have absolutely no doubt that I will be a best selling author in a matter of weeks thanks to Pam’s amazing course and her invaluable vault of knowledge and down to earth, honest, no holds barred, say it like it is advice! Thank you Pam Brossman!! Pam Brossman – Pam goes over and beyond. Informative, supportive and inspiring. 🙂 She is an Elite Woman helping other Elite Women achieve their book writing goals and I cant wait to to share the book that Pam has help me to get out of my head and onto paper. Her templates, prompts and online live training have given me the push and information I needed to see this project come to life ~ it’s the only program that I have joined ( and I have done heaps ) where I have showed up to 99% of the live training and coaching calls – This is where the gold is. Having Pam work along side of me, answering questions as they come up and guiding me through the process ( oh my goodness who would have thought there were so many pieces to the book writing puzzle to put together) has been incredible. Pam shows up and gives so much value in her Best Seller Influence group. I’ve often wondered whether she has a few clones hiding somewhere as whenever I need her she is there. What I love most about this program is her commitment to see her student succeed. I highly recommend working with Pam Brossman if you have the opportunity. 🙂 She is a pro! Pam has demystified the whole book writing through to publishing process and is so supportive and inspirational. I’ve been talking about writing a book for a decade. Thanks to Pam and her Best Seller Influence program I’m no longer talking about it, I’m doing it. Thanks heaps Pam!! Are you like me, promising yourself that one day you’ll write a book about your passion, as soon as you work out where to start? However when I heard a colleague was about to launch he her first book, and invited me to a 3 day Clarity Master Class to see if the program was suitable, I was hooked on the professionalism and expertise that Pam always provides! Since then the workbooks, live streaming, videos,Q and A Sessions and courteous response to requests from participants has been outstanding and I have learned so much not only about the writing process but also publishing to secure Best Seller ranking! In addition Pam has been patient, caring and cooperative, especially with those without previous experience! Thank you for this creative, challenging and deeply satisfying experience! Pam Brossman has demystified the book writing process for me. I love how she creates solutions, and make seemingly daunting tasks, manageable and simple to complete. With her expert knowledge and wealth of experience, she brings a warm and inspiring energy! I have loved being a part of her course, and couldn’t have completed my book without her guidance and support! In a world where everyone searches Google for information, certain knowledge still remains vague and can only be imparted by those who have done the hard yards and succeeded. Pam Brossman’s Best Seller Influence program, is the best example of such information. Pam has provided me with cutting-edge insight into marketing my business through the writing and authorship process. I was immediately impressed by her keen eye for details. Pam’s comprehensive knowledge and ability to focus my efforts and writing towards capitalising current industry trends has vastly improved my business and personal brand. Pam is a charismatic teacher, generous with her time and talents and genuinely eager to achieve the best outcome for all her students. Her commitment and support has been invaluable. Thanks Pam! 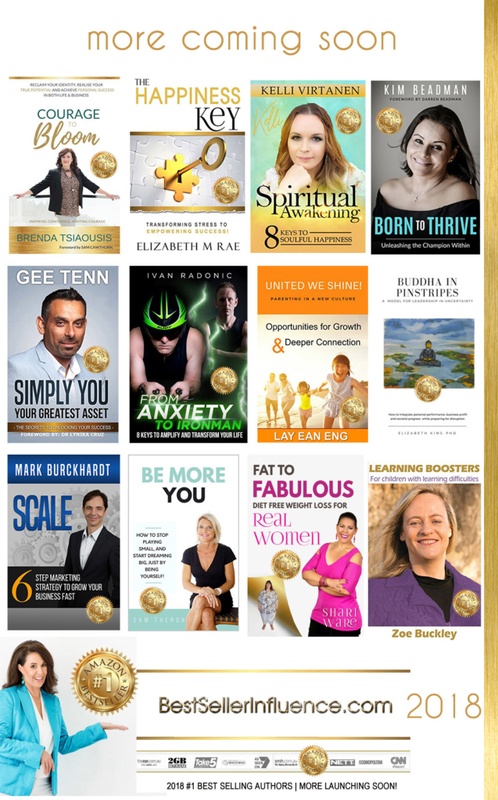 Pam Brossman’s Best Seller Influence program is a real true heart-based course. Pam’s passion to help you achieve your goal shines through every time she speaks. Pam makes you feel at ease with your learning and is there to assist you with any questions or queries. If you are looking for a beautiful down to earth person to mentor you then I highly recommend Pam Brossman. Her knowledge and expertise are deep and profound. She explains every step in such a beautiful understandable format no matter what your learning style may be. Thank you Pam for assisting me in my dream of publishing my book. 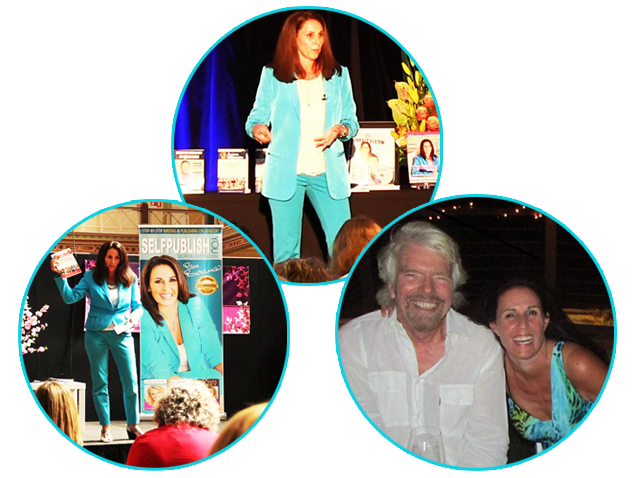 business and when Pam advertised her Best Seller Influence program, I just knew it was something I had to do. Apart from launching a product that I can now use for Positioning and Marketing, I have learnt so much more about myself and gained further clarity on the direction I want to take. Her ingenuity and integrity stands out above other Digital Marketers and if you are looking for a mentor who is honest and genuinely cares about your success, Pam is definitely worth speaking to. Pam Brossman’s Best Seller Influence program is fantastic. Pam’s passion and expertise in this area has helped me break through my fears, and procrastination of writing my book. Her knowledge and ability to put our ideas into book covers with pictures to match, our jumbled mind of words put eloquently and sequentially into corrected reading order. Always there to answer any questions, replying if not immediately, then by the end of the day. Pam has been more then a mentor on this program. Thank you Pam Brossman for all that you have done for me and this group, actually every program I have ever done with you, always received more than ever expected. Have you always wanted to write a book, but was too scared and didn’t know where to start? Me too!!! Pam’s mentoring is amazing. 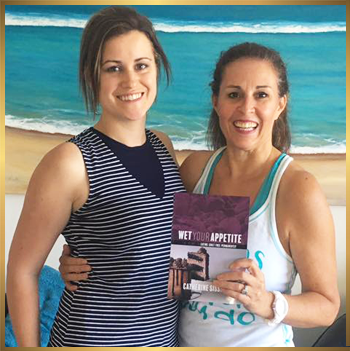 I joined her Best Seller Influence in January and have been blown away by Pam’s energy, positivity and commitment to us all. 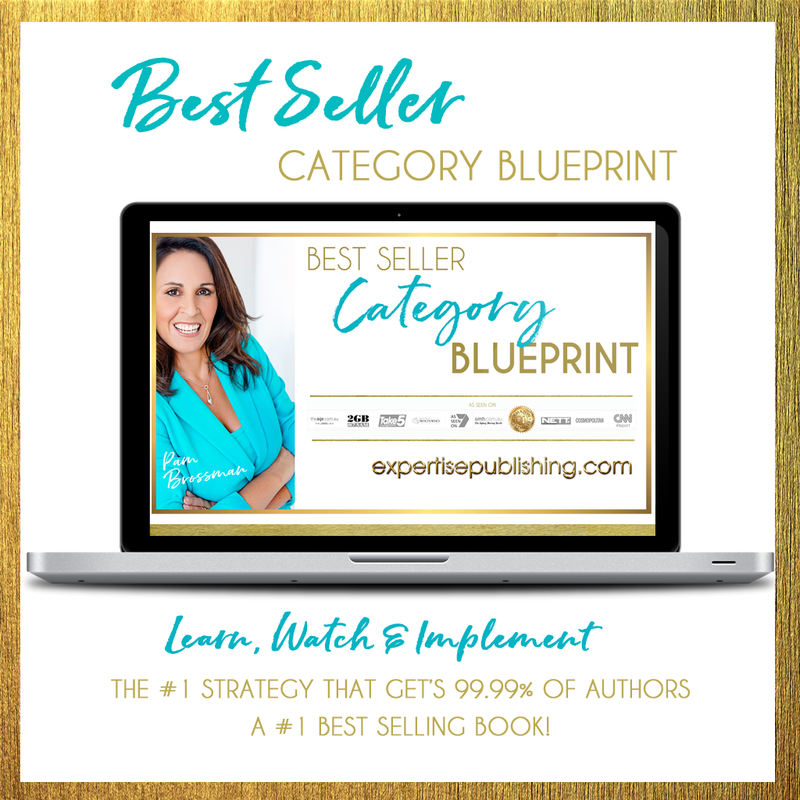 Not only is she THE go to expert that can masterfully guide you, step-by-step, to releasing an online book, but she is also a creative genius! She is generous with her ideas and is extremely supportive. It’s been a privilege to witness her in action and create magic for us all. I couldn’t have chosen a better person to work with to get my first book launched!! Pam’s knowledge of the process for launching a best seller is surpassed only by her generosity and kind spirit. Her passion for helping her clients share their stories and expertise underlies every class and interaction. 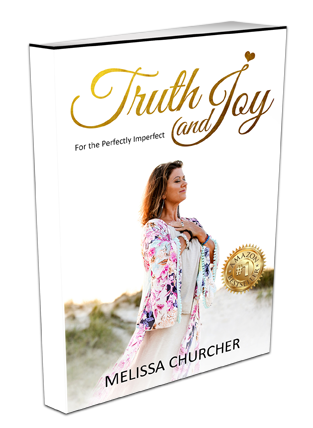 I’m so grateful to have her guidance as I launch my first book! 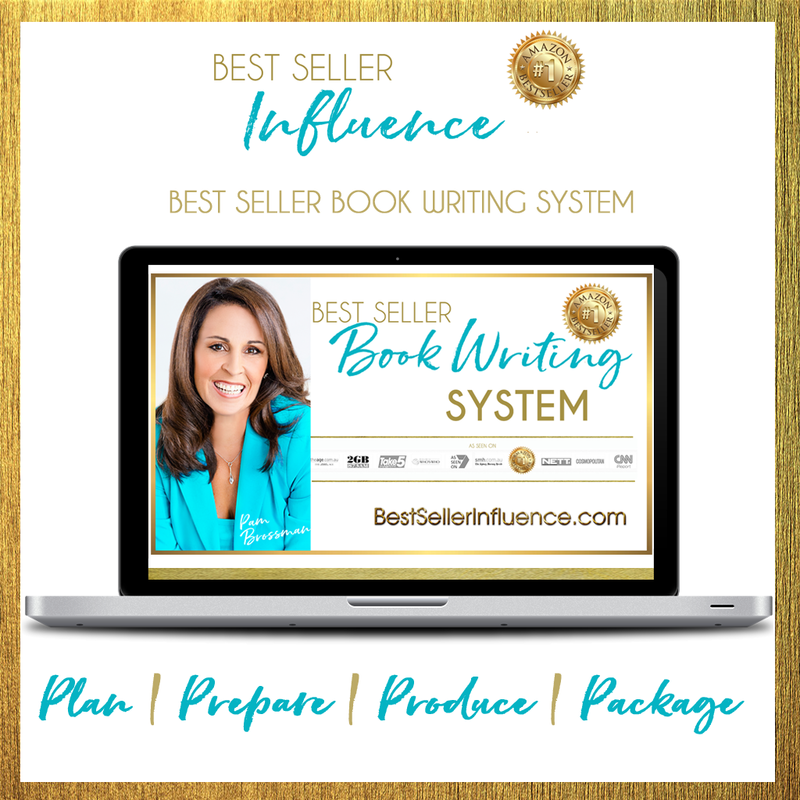 The Best Seller Influence is a must-do program for any upcoming authors wanting to stand of the crowd. Pam’s advice and guidance is invaluable and she with you every step of the way. There is no other program out there like it or gets even close. Don’t Be the World’s Best Kept Secret! Share Your Expertise, Impact More Lives & Create An Elite Authority Brand At The Same Time! Dene Menzel launched a brand new business called the Voice Factor. Launched a international online choir in the cloud, and more recently launched her new ‘voice your brand’ business, all off the back of her #1 Best Seller ‘The Voice Factor’. 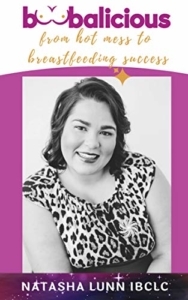 Maria Pau went from struggling ‘Not For Profit’ Recovery Coaching Business, to being featured in magazines, speaking on stages, studying for her PHD and growing from $13,000 to over six figures after launching four #1 Best Sellers on Amazon. Janet Schier has written three #1 Best Sellers and launched her own Property Education Business from her expertise as a millionaire property investor. Matt Clarke : turned his book into a joint venture opportunity with an elite company in Melbourne. 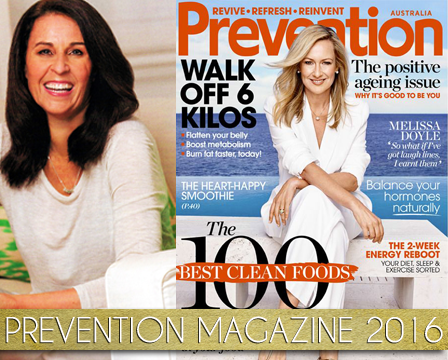 Andrew Crossley : TV Interviews, full page articles in magazines, and secured over $200k in clients and is about to launch his next Best Seller. Steve Brossman, who is just about to launch his second book, is using his #1 Best Seller as his client attraction magnet securing hundreds of thousands of coaching and consulting clients from just one book. That’s not including his speaking, coaching programs, products, events and overseas joint ventures. As for me, well I turned one book into a half a million dollar business, hundreds of thousands of free PR, speaking opportunities, TV, events, products, coaching programs, retreats….multiple profits centres for my business….and I am just about to write #13. Why? Because it works! Are You Going To Be My Next Success Story? Those wanting international positioning and exposure for their business and brand including those who have products, services, coaching or events who want to position their signature topics and programs as an Authority with a Best Selling book on Amazon. If any of these sound like you… then this is PERFECT FOR YOU! Your courses are THE BEST out there….. I’m serious! You ALWAYS go above and beyond- doing research and homework for us every time, giving everyone guidance….NO ONE does that!!!!! Oh- not to mention your honesty!!! You’re the best Pam ! Thank you!!!! EVERYONE should do your courses! They are transformational! 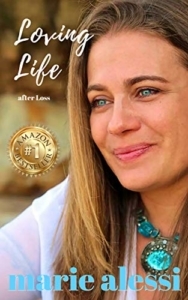 My book is my soul baring life story. So can you imagine how I felt when MY story hit NUMBER ONE? Achieving Best Seller is beyond surreal. Now that I’ve achieved this, I KNOW I can achieve ANYTHING. Pam’s course, her strategy, her one on one mentoring was everything I needed it to be and more. Pam has the knowledge, the experience but importantly she has a passionate heart that committed completely to helping me to rise as high as I could. Pam never left my side during my launch process and I am so grateful. Thanks Pam. Pam is the most amazing mentor who over delivers and genuinely cares about your success and is lots of fun too! I have been learning from Pam for 7 years. So fab finally meeting my self publishing mentor in person who helped coach me to become an author and get my book to completion with her incredible Best Selling Author program! Thank you Pam Brossman I couldn’t have got this book to where it is without your incredible wealth of knowledge, ongoing support and easy to follow teaching methods on how to be a self published author. I am so excited after 3 years working one on one with clients to be offering this Brand New Best Seller Influence program to help you share your knowledge, wisdom, passion, message and expertise in a book on Amazon. If your question has not been answered below please feel free to email pam@pambrossman.com and we will be able to get back to you within 24 hours. When Does The 12Mth Online Access Finish? Yes you have access to the complete online training program for 12 months from date of purchase. Do You Guarantee a Best Seller? There can be no guarantees for getting a Best Seller as Amazon changes the algorithms regularly. To date I have 100% success rate and I am 100% committed to the success of my students. There are many variables to getting a Best Seller on Amazon. The chance of you succeeding using my system is 99.9999% yes. Sadly, I’ve had to include a ‘non compete’ clause in this program due to the number of people who have taken my program and tried to compete with my business and my brand, using my proprietary system. This program is not for people who wish to teach others how to self publish a Best Seller on Amazon. It is for those who wish to self publish their own books and become an Amazon Best Selling Author only. By purchasing this program you agree not to share my copyright strategies and compete in the same self publishing space for a minimum of 2 years. Writing a book is a commitment. If you are not committed to writing and self publishing a Best Seller, this program is not for you. This Do It Yourself Online Guided Training comes with a 48 Hour Money Back Guarantee. Once you have access to the training you are locked into the program and have 12 months access to the course. Please ensure you are ready to invest in this program before purchasing.